We’d love your help. Let us know what’s wrong with this preview of The Inheritance by Christopher Fulton. When Christopher Fulton buys a gold Cartier watch that belonged to JFK and was part of the original assassination materials, it sets in motion something he never saw coming. A real page-turner. This book and the information in it is simply explosive. It changes everything I thought I knew about this period in time of American history. It's shocking. A must read. My thanks for the advance electronic copy that was provided by NetGalley, authors Christopher Fulton, Michelle Fulton, and the publisher for my fair review. A fascinating and explosive read. Fulton's story provides the missing pieces of the puzzle that reveals the raw mystery of the greatest mystery of the twentieth century. His story is harrowing, painful and epic. I highly recommend this book to read. It is a page turner of new information that is not easy to put down. Is this book for real? If it is, OMG. We should all be really afraid. Say it ain't so. I don't know what to believe. This book offered unique and explosive information about a period in our history that is written about frequently. I found this to be interesting and have recommended this book to others that I know that are fans of reading about American history. So this was an eye-opening book for me in a lot of ways, but that wasn't the only reason I'm giving it five stars. Christopher Fulton’s story is a real page turner, most memorable book I have read this year and one the best non-fiction I have ever read. This astonishing book is both timely and timeless. A vivid, well-written account with a deep insight of what really happened on November 22 in 1963 in Dallas, Texas. Meticulously researched, based on intimate letters, notes, diaries and artifacts, it provides a deep insight of the cover-up and the deep secrets that surrounded this dark day in U.S. history. It makes you realize, how many innocent lives, were and still are affected by JFK’s death, ongoing today. I believe this book deserves all the accolades it's been receiving. I have read more books on the JFK assassination than I can count, but certainly somewhere around two hundred. I am a member of the British research group Dealey Plaza U.K., and I have written articles on the Kennedy coup for the journal Dealey Plaza Echo. In this research I have come across a few books that I have had difficulty getting my head around, or books that fail to convince me of their historical provenance. 'The Man on the Grassy Knoll', 'Flight from Dallas' or 'Me & Lee' are examp I have read more books on the JFK assassination than I can count, but certainly somewhere around two hundred. I am a member of the British research group Dealey Plaza U.K., and I have written articles on the Kennedy coup for the journal Dealey Plaza Echo. In this research I have come across a few books that I have had difficulty getting my head around, or books that fail to convince me of their historical provenance. 'The Man on the Grassy Knoll', 'Flight from Dallas' or 'Me & Lee' are examples that lack corroboration and therefore fail to convince. Conspiracy theories are all very well and can be entertaining, but there is enough factual evidence in the many 'lone-nut' shootings to seriously question the official versions of history. 'The Inheritance' (2018) is undoubtedly one of the more incredible tales of this genre. In a book containing over five hundred pages the narrative takes three hundred and eighty, followed by one hundred and twenty five pages of documents and photographs to substantiate the text. To be perfectly honest, I am somewhat at a loss to know what to make of this. A story that includes the personal involvement of Ronald Reagan, Bill and Hilary Clinton, Caroline and John Kennedy Jr., and Donald Trump, that reads like a mix of Mills and Boon love story, a Steven King fiction and the Shawshank Redemption all rolled into one. Yet, the included documentation at the end of this book seems to confirm Christopher Fulton's story. If someone can convince me of the veracity of the plot, I should be adding more than two stars to this review. Unfortunately I don't like the novelistic way this has been written. There are scenes in the storyline that cannot be substantiated, for example, conversations in the Oval Office between Clinton and Janet Reno, or the details of Shauna Fulton's death. There are also minor inaccuracies and errors of historical facts. 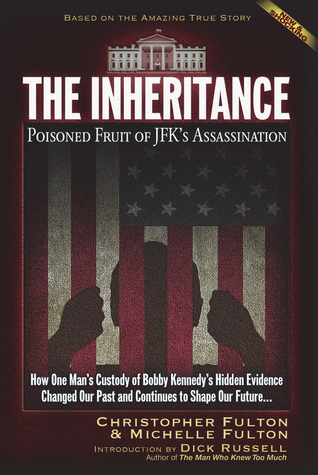 The Inheritance, The Poison Fruit of the JFK Assassination” is an amazing read of one man’s decent into the hell of being declared an “enemy” of the US government for possessing evidence from the JFK assassination that laid outside of US government hands by Robert Kennedy’s design. Simply put, this book is a true history changer that every American needs to read. One is left in shock and horror at the depths that the conspirators who killed Kennedy and installed their illegitimate government in The Inheritance, The Poison Fruit of the JFK Assassination” is an amazing read of one man’s decent into the hell of being declared an “enemy” of the US government for possessing evidence from the JFK assassination that laid outside of US government hands by Robert Kennedy’s design. Simply put, this book is a true history changer that every American needs to read. One is left in shock and horror at the depths that the conspirators who killed Kennedy and installed their illegitimate government in 1963, along with their political descendants, will go to in order to keep the truth from ever coming out. What an interesting and yet disheartening story! I really wish everyone would have access to this book and read it, especially those more than 35 years of age. It is a real page turner, and hard not make one want to turn Washington DC upside down. I won't tell more than that, to avoid spoiling the read. I've read them all re: JFK, but this one blew my mind. Comes at everything from a completely different angle. A must-read for any and all truth seekers. Engrossing, scary, sad, disgusting, etc. I loathe my government. READ THIS BOOK! How do we know what is truth and what is fiction? Where can I find more information about the auth? This book was frightening. I'm appalled at the top authorities in our country could do this!!! Shows you what lengths the government goes to hide the truth. Sometimes while reading this book I wondered if this was happening in America, or a third world dictatorship? Looking for reviews. Some things seem questionable coincidences/circumstances. No coherent(to me) explanation of significance of various items. Why did Fulton think he could hold onto assassination related evidence? If all the stuff in this book is real - WOW! Mind-shattering. All thinking Americans need to read this book; don’t wait. This is the most compelling book ever written about the murders of the Kennedys.